Contains: (1) XXK Fluidics System, (1) CoolFlow Infusion Sleeve 1.1/19g, and (1) Test Chamber. Intended for vet use only. This is not only a cassette system for the Series 20000 LEGACY but a Total Fluidics Management System for safe, clean and economical procedures. 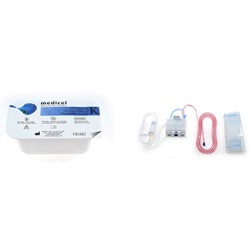 The Medicel Phaco Cassette Fluidxx Management System is compatible with Alcon Series 20000 Legacy.